Today’s Taste Test is a very special, very pink, girls-only edition, so The A.V. Club’s male readership should probably just make their way back to the front page while the ladies and I rap about girlified foodstuffs. Go on, off with you; maybe go rewatch that chicken-in-a-can snuff video again. Okay, I’m assuming it’s just you and me left here, Phel, so let’s get on with it. We ladies sure do have it rough when it comes to the male-dominated world of snack foods, don’t we? Why hasn’t the universal human need to eat food been tailored specifically to our needs, huh? What do men understand about what women like to eat? Am I right, ladies? Thankfully, some brilliant mind has tapped into the feminine psyche and isolated the three things that women look for in their snack foods—the color pink, subtle shame tactics, and GLITTER! The marketing push behind Fling brand chocolate fingers pivots on the tagline “Naughty… but not that naughty,” brilliantly reinforcing generations’ worth of food-guilt propaganda while offering a supposedly “empowering” alternative. The whole idea that eating chocolate is a subversive act isn’t new, but Fling blows it out to asinine proportions. Let’s take a look at some choice lines from the press release, shall we? Thanks, Thomas Pinnau, Vice President of Indulgence, for giving us ladies some chocolate liberation to keep us fueled for that next bout of passionate kissing. All this guilt-alleviating rhetoric hinges on the fact that each Fling chocolate finger (Flinger?) has only 85 calories, so you can eat like, two whole servings before having to run to the bathroom and stick your finger down your throat. Thing is, each Flinger is pretty tiny, roughly 16 grams. Compare that to a 57-gram Snickers bar, which has 273 calories—or about 77 calories for the same weight as one Fling. Good thing we lady-folk are too busy shopping and passionately kissing our boyfriends to bother with basic math. Or maybe they’re just hoping we’ll be distracted by the sparkles. That’s right: Fling bars are dusted with a thin layer of glittery gold powder for some reason. Presumably because we ladies like our chocolate like we like our vampires: Glittery and non-threatening. Her energy drink takes a less aggressive but more violently pink approach to the lady-food game. In case the name (an acronym, helpfully spelled out on the can, for “healthy energy revitalizer”) wasn’t enough of a tip-off, Her is a pink-lemonade-flavored energy drink served up in a “sleek and stylish” pink can, to keep us ladies energized while we do things like shave our legs with our pink razors while talking on our pink cell phones. Interestingly, an 8.4-ounce can of regular Her has nearly as many calories as a 12-ounce can of regular Coke, plus a shitload of sodium and carbs, so it doesn’t really seem to be competing with Tab on the lo-cal energy-drink front. Though it does come in a diet iteration that has no carbs and no sugar, but plenty of delicious taurine. Wait, taurine is pink, right? 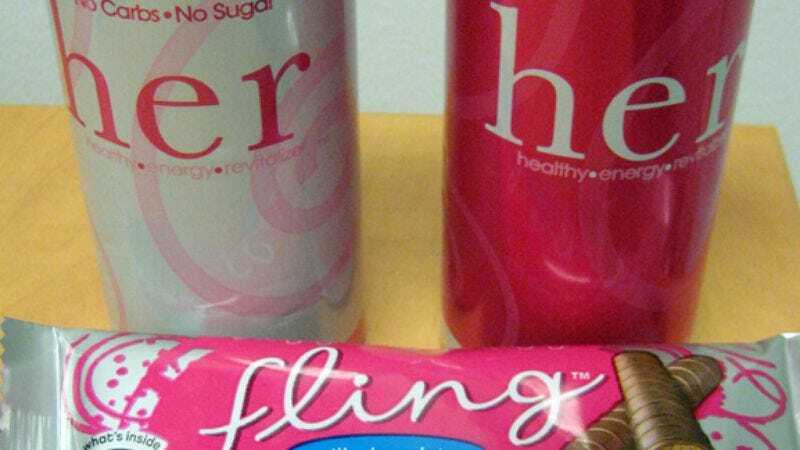 Taste: All sneaky calorie-gerrymandering aside, Fling bars are almost worth those pesky extra calories. We only got to taste the milk-chocolate version (Fling also comes in dark chocolate and hazelnut), but its airy meringue base topped with “delicate truffle” was surprisingly tasty, and the chocolate coating was suitably textured, if not exceedingly rich. The sparkles tasted like babies’ smiles and puppy kisses. Please note, none of our male taste-testers sprouted breasts or started talking about their feelings after consuming these products, so they are apparently safe for consumption by those in possession of a Y chromosome and enough self-confidence to eat a sparkly candy bar and Tab knock-off in public. Where to get it: Fling is currently only available over-the-counter in California, but you can order it online at flingchocolate.com. According to its website (herenergy.com), Her is available at a handful of Target stores across the country, as well as online.